Dozens of farm workers marched to the Western Cape Department of Rural Development and Land Reform in Long Street, Cape Town, on Friday. Led by Tshintsha Amakhaya, a civil society alliance, workers sang struggle songs, waved placards, and carried banners that read: "Evictions violate human rights" and "No to evictions". "The minister said he would send our demands to President Ramaphosa. The President has not come back to us. He [Skwatsha] is now running away from us," said Mzwakali. "Drakenstein Municipality in Western Cape has a caseload of 1,127 pending farm eviction matters," said Mzwakali. "At an Indaba on farm evictions hosted by the South African Human Rights Commission in April 2018, Drankenstein municipal manager Lauren Warin acknowledged that the municipality had become a hotspot for evictions with an estimated 20,000 people threatened." Mzwakali said: "Tshintsha Amakhaya further demands that the Western Cape farms be used as the testing ground for land expropriation without compensation." 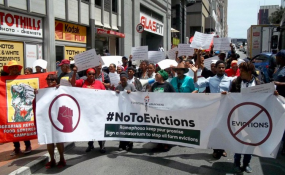 He said the march was "part of the #NoToEvictions Campaign calling on President Ramaphosa to immediately suspend all farm evictions in a formally signed moratorium which guarantees concessions to be awarded when the moratorium is breached and penalties levied against those involved in farm evictions." The workers' memorandum demanded to see all records and documentation relating to the number of notices served on the Western Cape Provincial Department of Rural Development and Land Reform in terms of the Extension of Security Tenure Act from January 2016 and January 2019. They also want all records relating to calls made to the department's evictions toll-free number. Nomfanelo Magadla, who works as a farm worker in Rawsonville near Worcester, said she wanted the department to act against abusive farmers. "Farmers financially and emotionally abuse us at their farms. We don't even get a minimum wage," she said. "After your husband dies, a farmer kicks you out of his farm." "Farmers hit you and even dismiss you from work if you back-chat and tell them a truth that they don't want to hear," said farm worker Joann Johannes. She said she had witnessed six evictions of farm workers in Worcester since January. "New farmers who have bought farms from our bosses immediately evict farm workers and start to build big, fancy houses on agricultural land," she said. "We farm workers want to use the agricultural land to provide for our families." "Some of the houses we stay in have crumbling walls, and don't have windows and doors, but we pay rent for them," she said. Farm workers, she said, often don't have electricity, toilets and water inside their houses.